The Settlement Agreement posted here about Accessible Pedestrian Signals with the City and County of San Francisco was the first in the country to address this critical pedestrian safety issue. A joint press release about APS was issued to announce the settlement. As required by the agreement, the City of San Francisco has adopted an official APS policy. Read the San Francisco APS policy on the SFMTA website. In the agreement the City agreed to spend at least 1.6 million dollars and install APS at at least 80 intersections. (As of January, 2010, the City has far exceeded the contract benchmark, and has installed APS at 116 intersections throughout the City.) The Agreement was negotiated by Lainey and co-counsel Linda Dardarian using Structured Negotiations. Claimants in the case were the California Council of the Blind, the San Francisco based LightHouse for the Blind and Visually Impaired, the Independent Living Resource Center San Francisco, and blind advocate Damien Pickering. As exhibits to the Settlement Agreement, the parties negotiated Technical Specifications and a detailed tool to help public entities prioritize intersections for APS installation. Contact us if you would like a copy of the tool. WHEREAS, The Parties have reviewed commercially available APS technology and research regarding the safety and accessibility of available APS technology as of the date of this Agreement and have agreed upon the standards set forth in the Technical Specifications attached hereto as Exhibit A. As used in this Agreement, the following terms shall have the meaning ascribed to them in this Section. Capitalized terms used in this Agreement and not defined in this Section II are defined in the Technical Specifications. “Agreement” shall mean this Settlement Agreement and Release of Claims and all Exhibits attached hereto. “APS” shall mean a Pushbutton-Integrated device that communicates information about Pedestrian Timing in a non-visual manner, such as audible tones, speech messages, and vibrating surfaces, and has the following features to the extent that they are available from an APS vendor: (1) a Pushbutton Locator Tone; (2) a pushbutton actuation tone and light in response to the button push to indicate that the button has been pressed; (3) an Audible Walk Indication; (4) a Vibrotactile Walk Indication; (5) automatic volume adjustment in response to ambient sound; (6) a tactile arrow; (7) a Pushbutton Information Message; (8) street name in Braille and Large Print; and (9) a Pushbutton with a 2″ minimum diameter. “APS Consultant” shall mean a contractor to be retained by City for expert consulting services related to APS. The APS Consultant shall be an orientation and mobility specialist certified by the Academy for Certification of Vision Rehabilitation and Education Professionals and an expert in APS. “APS Intersection” shall mean an Intersection where APS are installed on both ends of every Crosswalk in the Intersection. For example, an Intersection with four crosswalks becomes an APS Intersection when eight APS are installed at the Intersection. “Claimants’ Counsel” shall mean Goldstein, Demchak, Baller, Borgen & Dardarian and The Law Office of Elaine B. Feingold, and the attorneys practicing law therein. “Claimants’ Priority List” shall mean that certain list of Intersections that are a high priority for APS installation as identified by the Claimants, attached hereto as Exhibit B and fully incorporated herein. “Effective Date” shall mean that date the SFMTA Board of Directors approves this Agreement, or the date that all Parties have signed this Agreement, whichever is later. “Individual APS Request Policy” shall mean the policy to be adopted pursuant to Section IV.I.1 of this Agreement for the intake and processing of public requests for APS installations. “Intersection” shall mean a location with one or more pedestrian crosswalks, including mid-block crossings, and with one or more Visual Pedestrian Signals associated with the crosswalks. “Intersection Assessment” shall mean the process of evaluating an Intersection in accordance with the standards set forth in the Prioritization Tool, for the purpose of assigning an Intersection Score to an Intersection being evaluated for APS installation. “Intersection Score” shall mean the numerical score assigned to an Intersection following an Intersection Assessment using the Prioritization Tool attached hereto as Exhibit C.
Mid-block crossing signal on Phelan Avenue at City College. “Prioritization Tool” shall mean the document containing standards for conducting an Intersection Assessment for the purpose of prioritizing Intersections for APS installation based upon evaluation factors and weights specified in the Prioritization Tool, which is attached hereto as Exhibit C and incorporated by reference as though fully set forth herein. “Public APS Request List” shall mean the list of requests received from members of the public for APS installations at particular Intersections within San Francisco. The Public APS Request List that exists as of the Effective Date of this Agreement is attached hereto as Exhibit D and incorporated by reference as though fully set forth herein. “SFMTA Board” shall mean the Municipal Transportation Agency Board of Directors. “Status Meeting” shall mean the regularly scheduled meeting between the Parties to this Agreement as described in Section IV.J.1 of this Agreement. “Technical Specifications” shall mean the technical standards for APS. The Parties hereby agree upon a current set of Technical Specifications for APS, attached hereto as Technical Specifications and incorporated by reference as though fully set forth herein. This Agreement is subject to the prior approval of the SFMTA Board. In entering into this Agreement, the City does not admit, and specifically denies, that it has violated or failed to comply with any provisions of any applicable laws of any state relating to accessibility for persons with visual impairments, any regulations or guidelines promulgated pursuant to those statutes, or any other applicable laws, regulations, or legal requirements. By entering into this Agreement, no party is admitting the sufficiency of any claim, allegation, assertion, contention or position raised by the other party or the sufficiency of any defense to any such claim, allegation, assertion, contention or position. The City’s entry into this Agreement is not and may not be used by any person or organization as an admission or evidence that the City has engaged in any practice that violates any law or regulation. This Agreement contains the entire agreement between the Parties. This Agreement expresses the complete and final understanding with respect to the subject matter of this Agreement. The Parties hereto understand and agree that the terms of this Agreement supersede any prior discussions, understandings, or agreements between them related to the subject matter hereof. The signatories to this Agreement represent and warrant that they have the authority to execute this Agreement and to bind parties on whose behalf they execute this Agreement, that the Agreement does not require court approval, and that it does not conflict with or contravene the terms of any agreement, judgment or order binding or enforceable against the Parties hereto. The Parties each acknowledge that they are entering into this Agreement freely, knowingly, voluntarily and with a full understanding of its terms. The Parties acknowledge that they have consulted with counsel of their own choosing concerning this Agreement and that they were given reasonable time to review and consider the terms of this Agreement. The language of this Agreement shall be construed as a whole according to its fair meaning, and not strictly for or against any of the Parties. The terms of this Agreement are the product of joint negotiations and shall not be construed as having been authored by one party rather than another. Any ambiguity shall not be construed against any Party. Where required by context, the plural includes the singular and the singular includes the plural. The headings in this Agreement are solely for convenience and will not be considered in its interpretation. If any provision or provisions of this Agreement shall be held invalid, illegal or unenforceable, the validity, legality and/or enforceability of the remaining provisions shall not in any way be affected or impaired thereby. This Agreement may be executed in counterparts, each of which will be considered an original, but all of which, when taken together, will constitute one and the same instrument. If any party to this Agreement contends that there is a change in any applicable law or regulation relating to APS that will require modification of this Agreement, that party shall notify the other party in writing. The notification will include a specific proposal for the amendment of the language of this Agreement as required by the change in law or regulation. Within ten (10) business days of receipt of notice of the proposed amendment, the other party shall provide a written statement setting forth its response to the proposed amendment. If the Parties are in agreement regarding the proposed modification, the modification shall be offered as soon as possible to the SFMTA Board for its consideration with a request for its approval. If the Parties cannot reach agreement regarding the proposed amendment within sixty (60) calendar days from the date of the original notice of proposed amendment, the proposed amendment shall be submitted to Dispute Resolution pursuant to Section VII.B below. To the extent any documents are required to be executed by any of the Parties to effectuate this Agreement, each party hereto agrees to execute and deliver such and further documents as may be required to carry out the terms of this Agreement. Neither party shall be liable for breach of this Agreement when any failure to comply with a requirement of this Agreement is due to causes beyond the reasonable control of the party required to perform, such as acts of God, acts of terrorism, acts of civil or military authority, civil disturbances, labor disputes, government order or regulation, abnormal weather conditions, earthquakes, fires, strikes, floods, epidemics, quarantine, war, riot, delays in transportation, and inability due to causes beyond the reasonable control of the party to obtain necessary labor, materials or manufacturing facilities, and in such event the party required to perform shall perform as soon as such cause is removed. In the event that a party wishes to invoke this Section III.L it shall provide written notice to the other party as soon as practicable of the conditions that are preventing performance, the performance obligations under this Agreement that are affected by those conditions, whether the party whose performance is affected anticipates that it will be able to complete performance when the conditions are removed, and if so, when performance of the obligation is anticipated to be completed. The Agreement is for the benefit of the Parties hereto only and no other person or entity shall be entitled to rely hereon, receive any benefit here from, or enforce against either party any provision hereof. The Parties specifically intend that there be no third party beneficiaries to this Agreement. No modification of this Agreement by the Parties shall be effective unless it is in writing and executed and approved in the same manner as the original Agreement. Any party may change such persons and/or addresses by written notice to the other Parties, which shall include new contact information for that party. SFMTA agrees to expend at least $1,600,000.00 (one million six hundred thousand dollars) for APS planning, installation and administration for the Intersections at which APS are to be installed pursuant to this Agreement. Additional Funding. SFMTA will seek additional funding other than the funding identified in this Agreement for APS during the term of this Agreement, including but not limited to funding through the SFMTA budget, and through federal, state and local funding sources. Except for the amount specified in Section IV.A above, the Parties understand that SFMTA requests for APS funding in its budget or applications for grants and loans do not guarantee that the SFMTA will receive funding as a result of any funding request. Cooperation with Other City Agencies. The Parties recognize that in addition to SFMTA, other departments, agencies, commissions, boards, and councils of the City and County of San Francisco, including but not limited to the Mayor’s Office on Disability and the Mayor’s Disability Council, may be able to provide or assist in obtaining funding for APS beyond the funding identified in this Agreement. Throughout the term of this Agreement, SFMTA agrees to work with and coordinate the efforts of all such City departments and agencies towards the Parties’ shared goal of increasing APS funding beyond the amount stated in this Agreement. The Parties agree to support each other’s efforts to obtain additional APS funding from such other City departments, agencies, boards, commissions, and councils, including from the Office of the Mayor, and from the San Francisco Board of Supervisors. Caltrans Intersections. SFMTA will request that CalTrans participate in the cost of APS installation at any Intersection scheduled for signal upgrades, installation or alteration that is part of the State highway system in the City. SFMTA will request that Caltrans install APS that comply with the Technical Specifications described in Section IV.D, below, at all Intersections in the City that are part of the State highway system, including but not limited to State Route 1, at which signal upgrades, installation or alteration will take place. Allowable SFMTA Expenses. Allowable SFMTA expenses for APS under this Agreement include APS equipment, extended warranties, incremental costs of planning (such as intersection scoring, public outreach for APS, the APS Consultant contract expenses and administration of SFMTA APS policies), new Intersection design and Intersection modification design directly attributable to APS, installation costs, and any troubleshooting or adjustments to APS installations that are required by problems unique to APS technology, project management costs, and any other APS related costs mutually agreed to by the Parties. How to apportion the funding among allowable expenses for APS within the requirements of this Agreement is a matter within the discretion of the SFMTA. Phase 2 Pilot Project Intersections. 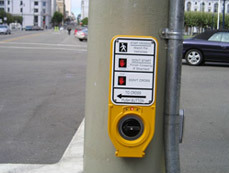 By June 30, 2007, SFMTA agrees to complete APS installation at all Phase 2 Pilot Project Intersections. Third Street Light Rail Corridor. By June 30, 2007, SFMTA shall install APS at no more than thirty-eight (38) Intersections in which SFMTA is already making Intersection modifications as part of the construction of the Third Street Light Rail Project. BART Intersections. By December 31, 2007, SFMTA shall install APS at the Intersections serving Bay Area Rapid Transit stations at the corners of 16th Street and Mission Street, and 24th Street and Mission Street. Claimants’ Priority List Intersections. By December 31, 2009, and to the extent to which they are not already included in the Phase 1 Pilot and/or APS installation priorities listed above, SFMTA shall install APS at all Intersections included in Claimants’ Priority List. Public APS Request List Intersections. Subject to Section IV.B and to the extent to which they are not already included in the Phase 1 Pilot and/or APS installation priorities listed above, SFMTA shall install APS at Intersections for which APS installation has been requested by a member of the public, subject to prioritization through use of the Prioritization Tool. CalTrans State Route 1 Signal Upgrade Project Intersections. The Parties acknowledge that CalTrans Intersection projects are planned for 19th Avenue during the term of the Agreement. APS installations at Intersections on 19th Avenue that are included in Exhibits B or D shall be completed in accordance with the CalTrans construction schedule for those Intersections. C. Phase 1 Pilot Project Intersections. The APS at the Phase 1 Pilot Project Intersections shall conform to the Technical Specifications by June 30, 2007. The six Phase 1 Pilot Project Intersections are in addition to the “at least eighty (80) intersections” described in Section IV.B above. The City shall maintain current Technical Specifications for APS at all times, and shall conduct all APS installation, operation and maintenance in accordance with the then-current Technical Specifications. The Technical Specifications as of the Effective Date are attached hereto as Exhibit A. The Parties acknowledge that the Technical Specifications may change over time, depending on factors which include but are not limited to changes in legal requirements, advances in APS technology, commercial availability of APS equipment, APS user feedback and the City’s experience with APS installation and maintenance. During the term of this Agreement, the City shall give Claimants an opportunity to review and comment on any proposed amendments to the Technical Specifications prior to their adoption by the City. All such amendments shall be consistent with the Americans with Disabilities Act and applicable California disability access laws. E. Newly Signalized or Upgraded Intersections. Throughout the term of this Agreement, at all newly signalized and upgraded intersections where APS are not yet being installed, SFMTA shall do work to make them ready for eventual APS installation. Such “make ready” work shall mean incorporating the requirements for eventual APS installation into the design of the work to be done in the Intersection consistent with the then-current Technical Specifications. All new poles installed at newly signalized and upgraded intersections will be located, to the extent possible, to make them APS-ready. Conduit will be laid as part of the “make ready” work when necessary to connect a pedestrian signal to a remotely located pole where APS would be installed. F. Maintenance of Existing APS Intersections. MTA shall install and configure all APS to be operational at all times when the associated vehicular signal is in normal operation, except during temporary periods of maintenance or repair. Should an APS malfunction, the City will correct the problem as soon as possible. SFMTA shall maintain existing APS Intersections, giving priority to those APS Intersections that have been the subject of maintenance complaints from the public. SFMTA shall create an intake form for APS complaints that is accessible to people with visual impairments and a tracking mechanism for SFMTA’s responses to such complaints. In information regarding its APS installations and policy, the City will provide a phone number and an email address that can be used by the public to report APS malfunctions or maintenance issues and to follow-up regarding SFMTA’s response to such complaints. If SFMTA expenditures for troubleshooting and non-routine maintenance of APS installations exceed fifty thousand dollars ($50,000) in any three month period during the term of this Agreement, then the schedule and deadlines for APS installations at Intersections subject to this Agreement shall be renegotiated by the Parties using the following procedure: If during the term of this Agreement the City wishes to renegotiate the APS installation schedule based on greater-than-anticipated maintenance costs under this Section IV.F.2, the City shall provide written notice to the Claimants detailing the APS maintenance problems and including the City’s proposed change to the APS installation schedule specified in this Agreement. The Parties shall meet and confer in good faith over a period not to exceed forty-five (45) days from the date of the City’s notice, during which period the installation schedule set forth in this Agreement shall be suspended. If the Parties cannot agree on a revised APS installation schedule within forty-five (45) days from the City’s written notice, then either party may submit the matter for resolution according to the dispute resolution procedures set forth in Section VII. During the term of this Agreement the City shall maintain a contract with an APS Consultant. City will consult Claimants on the selection of an APS Consultant during any APS Consultant selection process, including giving Claimants the opportunity to interview any proposed APS Consultant. The APS Consultant shall provide the following services at SFMTA request: participate in Intersection Assessments, review APS complaints, review the completed installation of APS at any Intersection, make recommendations on potential changes to SFMTA APS policies or Technical Specifications; and report to the Parties on APS issues at Status Meetings described in Section IV.J.1 herein. An Intersection Assessment shall be conducted at (i) any Intersection at which APS is to be installed, (ii) any Intersection for which APS has been requested, and (iii) all Intersections within San Francisco that are included in the CalTrans State Route 1 Signal Upgrade project during the term of this Agreement. Participation of APS Consultant. The SFMTA may request the assistance of the APS Consultant for Intersection Assessments. Public Request List Intersection Assessments. If an Intersection Assessment is being conducted as a result of a request by a member of the public, that person shall be given notice and an opportunity to participate in the assessment. The procedure for requestor participation in Intersection Assessments shall be set out in detail in the SFMTA’s Individual APS Request Policy to be developed by SFMTA pursuant to this Agreement. Prioritization Tool. The City shall maintain a Prioritization Tool for the purpose of identifying the evaluation factors to be used in Intersection Assessments at all times, and shall conduct all Intersection Assessments in accordance with the guidelines in the then-current Prioritization Tool. The Parties acknowledge that the factors to be considered in an Intersection Assessment may change over time, depending on factors which include but are not limited to changes in legal requirements, advances in APS technology, APS user feedback and City’s experience with APS. During the term of this Agreement, the City shall give Claimants an opportunity to review and comment on any proposed amendments to the Prioritization Tool prior to their adoption by City. Disputes regarding substantial changes to the Prioritization Tool will be resolved pursuant to the Dispute Resolution provisions of Section VII of this Agreement. A mechanism for tracking APS requests and SFMTA responses, including name of requestor, date of request, unique request tracking number, identification of intersection for which APS is requested and the Intersection Score. Standard information to be effectively communicated to APS requestors within ten (10) business days of the receipt of the request, including but not limited to a unique tracking number for the request status, the requestor’s right to participate in the Intersection Assessment on the date and time that it is scheduled. SFMTA will accommodate reasonable requests to reschedule Intersection Assessments to accommodate requestors. A process for providing a preliminary Intersection Score to the requestor within a specified time period of the request and a procedure for the requestor to contest the score. At the time of providing a requestor the preliminary Intersection Score, SFMTA shall also effectively communicate to the requestor the relative priority of the requested Intersection as compared to all other Intersections then scheduled for APS installation, any work being planned by SFMTA at that intersection, and, given then current APS installation priorities, whether APS are likely to be installed at that Intersection within the succeeding three (3) years. Such notice shall also provide the requestor with the name and phone number of a contact person at SFMTA to answer questions about the request. APS Installation Policy. The SFMTA shall draft a policy that identifies SFMTA’s ongoing policies and procedures regarding APS consistent with this Agreement. Claimant Review of SFMTA Policies. Within sixty (60) calendar days of the Effective Date of this Agreement, SFMTA shall provide Claimants with a draft Individual APS Request Policy and a draft APS Installation Policy. Within ten (10) business days of receipt of a draft policy, Claimants shall provide written comments regarding the draft policy. If the Parties are in agreement regarding the content of a draft policy, the policy shall be presented as soon as possible to the SFMTA Board for its consideration, with a request for its approval and, if approved by the SFMTA Board, shall be adopted and implemented by the SFMTA. Consistent with its obligations as a public agency, the SFMTA reserves the right to present its APS policies to any public body for public review and comment on the contents of APS policies, and to adjust APS policies as the SFMTA deems necessary to respond to public need, as long as the policies remain consistent with the Americans with Disabilities Act and applicable California disability access laws. Status Meetings. The Parties shall meet at least twice per calendar year during the term of this Agreement to discuss the status of installations, status of the Public Request List, complaints related to APS, APS user community feedback, potential funding sources, the status of any SFMTA funding requests for APS, Technical Specifications, SFMTA APS policies, plans for future APS installations, and any other APS-related issue that a party would like to discuss. At least ten (10) business days prior to each status meeting, each party shall submit to the other in writing any changes proposed to SFMTA APS policies or APS Technical Specifications. Claimants may request that other City personnel, CalTrans personnel, or vendor representatives with information about any of the issues to be discussed be present at the Status Meeting, and the City will make good faith efforts to arrange for the participation of those persons or entities. Proposition K Prioritization Program Renewal. SFMTA shall provide a meaningful opportunity to Claimants to participate in the development of the SFMTA’s funding request for the upcoming Proposition K Prioritization Program of the San Francisco County Transportation Authority. Dissemination of Public Information. The Parties will cooperate to provide APS information to the public and mechanisms for public feedback about APS in San Francisco, including but not limited to posting APS information on the SFMTA website, including all Intersections where APS are installed; the Individual APS Request Policy; procedures for submitting requests for APS maintenance or APS complaints; information on APS operation and functionality and the City’s APS Installation Policy. SFMTA shall also request such information to be posted on other appropriate City websites. The City shall make all information listed in this Section IV.J.3 available to members of the public with visual impairments in alternative formats upon request. Status of CalTrans projects in the City and efforts to obtain funding from CalTrans for APS Installations. Work with SFMTA to disseminate APS information to the public. As part of that program, Claimant San Francisco LightHouse will provide information to members of the blind community about the City’s APS program and will conduct a reasonable number of demonstrations of installed APS for the blind community, the exact number of which to be solely determined by the LightHouse. Subject to the availability of demonstration units on loan from the manufacturer, the SFMTA will loan the LightHouse one APS for training purposes for at least the first twelve months following the Effective Date. This Agreement shall remain in effect from the Effective Date until June 30, 2010. Notice of Potential Dispute. If a party (the “Initiating Party”) believes that the other party (the “Responding Party”) has not complied with any provision of this Agreement, the Initiating Party shall provide the Responding Party with Notice of potential dispute containing the following information: (i) the alleged act of non-compliance; (ii) a reference to the specific provision(s) of the Settlement Agreement that the Initiating Party claims has been violated; (iii) a statement of the remedial action sought by the Initiating Party; and (iv) a brief statement of the specific facts, circumstances and legal argument supporting the position of the Initiating Party. Response. Within thirty (30) calendar days of receipt of a Notice as described above, the Responding Party shall respond to the Initiating Party in writing. Within ten (10) business days of receipt of a Response as described above, the Parties will meet and confer and negotiate in good faith for at least thirty (30) days in an attempt to resolve their dispute. If the Parties cannot resolve the disputed issue through the meet and confer process described above, the Parties agree to use a mutually acceptable mediator or mediation service to mediate the dispute. The Parties will agree on a mediator or mediation service within thirty (30) days following the end of the meet and confer period set forth in Section VII.A, and set a date for mediation to take place promptly. Should mediation prove unsuccessful, either party may file an action to enforce this Agreement. The Parties agree not to file any judicial action to enforce this Agreement until this dispute resolution process has been completed and then only if the alleged violations or noncompliance with this Agreement have not been corrected as a result of the dispute resolution effort by the Parties. By no later than December 21, 2009, the Parties shall begin negotiations in good faith to enter into a further agreement regarding the issues set forth in Section VIII.B herein. Such negotiations shall continue for a period not to exceed ninety (90) days unless the Parties mutually agree to extend the period further (”Future Negotiations”). During the Future Negotiations, the Parties shall negotiate in good faith regarding a further plan for installing APS at Intersections in the City, and extension and/or modification of the programs, policies, and procedures implemented as a result of this Settlement Agreement. In return for the consideration provided for in this Agreement, upon the Effective Date of this Agreement, Claimants release the City and its officers, boards, commissions, directors, parents, subsidiaries, affiliates, successors, insurers, employees, attorneys, and agents (”Released Parties”) from any and all claims, liabilities, obligations, demands, and actions, that were brought or could have been brought against the Released Parties regarding legally required access to information provided by pedestrian signals at Intersections at which APS are installed pursuant to Section IV of the Agreement (hereinafter referred to as “Claims”), provided the APS at those Intersections continue to be maintained in accordance with Section IV.F.2 of the Agreement. This Release encompasses, without limitation, any Claims arising directly or indirectly out of or otherwise connected with: (a) the Americans with Disabilities Act; and (b) any other federal, state, or local statute or regulation involving the rights of persons with disabilities. B. Covenant Not to Sue. Except as required by due legal process not initiated directly or indirectly by any of them, and for the time period set forth in Section IX.C. herein, Claimants expressly covenant that none of them will file, initiate, commence, institute, maintain or prosecute any action at law, suit in equity or other proceeding arising out of, or in any way connected with claims, cross-claims or counterclaims, liens, demands, rights, causes of action, debts, obligations, contracts, expenses, damages and liabilities of any kind whatsoever, whether liquidated or unliquidated, whether at this time suspected, known or unknown, and whether anticipated or unanticipated, that Claimants have had in the past, now have, or may have in the future against the Released Parties for any act or omission occurring through and including the term of this Covenant Not to Sue, as set forth in Section IX.C. herein, for any and all information provided by pedestrian signals in the City. This Covenant Not to Sue does not extend to any claim based on any alleged failure by the City to perform any of its obligations under the Settlement Agreement, which shall be handled pursuant to the terms of Section VII, herein. C. Term of the Covenant Not to Sue. The covenant not to sue set forth in Section IX.B. herein shall extend from the Effective Date until the later date of either June 30, 2010, the expiration of the Future Negotiations period described in Section VIII, above (should the Claimants elect to engage in such Future Negotiations), or any agreed upon extension thereto. Should the Parties execute a further Settlement Agreement as a result of the Future Negotiations, that Agreement, or an associated Addendum, shall include an appropriate release of Claimants’ Claims. Within fifteen (15) calendar days of the Effective Date of the Agreement, the Parties shall hold a joint press conference and issue a joint press release to announce the City’s APS program. A. Attorney’s Fees, Expenses and Costs from Inception to and Including April 10, 2007. The SFMTA will make two payments to Claimants’ Counsel which together shall be payment in full for reasonable attorney’s fees, costs, and expenses, including consultant and expert witness fees and costs, for Claimants’ Counsel’s time and expenses in connection with this matter through and including April 10, 2007. The first payment shall be due promptly following July 1, 2007 and shall be in the amount of one hundred eighty-five thousand five hundred twenty dollars and ninety-seven cents ($185,520.97). The second payment shall be in the amount of one hundred seventy-five thousand ($175,000.00) and shall be due promptly following July 1, 2008. Each payment shall be made payable to Goldstein, Demchak, Baller, Borgen & Dardarian and to the Law Office of Elaine B. Feingold, to be divided as they instruct, and to be delivered to Linda M. Dardarian, Goldstein, Demchak, Baller, Borgen and Dardarian, at 300 Lakeside Drive, Suite 1000, Oakland, California 94612. Promptly following July 1, 2007, the SFMTA will deliver to Linda M. Dardarian, Goldstein, Demchak, Baller, Borgen and Dardarian, at 300 Lakeside Drive, Suite 1000, Oakland, California 94612, a check in the amount of thirty thousand dollars ($30,000.00) payable to the “Goldstein, Demchak, Baller, Borgen and Dardarian Client Trust Account.” This amount shall be payment in full and final settlement of the Claims of Claimants that are being released in Section IX, above. C. Attorney’s Fees, Expenses, and Costs, Including Expert Fees, Incurred between April 11, 2007 and the Expiration Date of the Agreement. Subject to the following terms, the City shall pay Claimants’ Counsel reasonable attorney’s fees, expenses, and costs, including expert fees, incurred between April 11, 2007 and the expiration date of the Agreement, for performing all work reasonably necessary to monitor, implement and administer the Settlement Agreement, including but not limited to reviewing reports, participating in semi-annual meetings, reviewing and commenting on SFMTA policies, and participating in and memorializing any agreement that may result from the Future Negotiations set forth in Section VIII, above. For each calendar quarter during the term of this Agreement, Claimants’ Counsel shall submit to the City a statement of reasonable attorney’s fees, expenses and costs incurred during the previous quarter. Promptly following July 1, 2009 and after the Parties have resolved any dispute about the amount of such fees and costs, SFMTA shall pay to Claimants’ Counsel all reasonable attorney’s fees and costs incurred and during calendar years 2007 and 2008. For each subsequent calendar year during the term of this Agreement, SFMTA shall pay for all reasonable attorney’s fees and costs promptly following Claimants’ Counsel’s submittal of the final statement of fees and costs for that calendar year and after the Parties have resolved any dispute about the amount of such fees and costs. Claimants’ Counsels’ quarterly statements of fees incurred shall be supported by a description of services by date and by biller and, subject to the provisions of Subsection XI.C.2, below, shall not exceed the following total amounts per period (”Period Caps”): $30,000 for April 11 to December 31, 2007; $20,000 for January 1, 2008 to December 31, 2008; $20,000 for January 1, 2009 to December 31, 2009; and $25,000 for January 1, 2010 to December 31, 2010. Any objections or disputes regarding the statement shall be handled pursuant to the procedure set forth in Section VII, above. Work performed pursuant to Section VII shall not be subject to the Period Caps set forth herein but shall instead be subject to Section XI.D, below. D. Attorney’s Fees, Expenses and Costs Incurred Pursuant to Section VII. Standard for Payment of Attorney’s Fees, Expenses and Costs. If any of the Parties files a Notice of Potential Dispute, initiates renegotiation of the APS installation schedule as set forth in Section IV.F, above, or submits any other issue for Dispute Resolution pursuant to Section VII of the Settlement Agreement, reasonable attorney’s fees, litigation expenses, expert witness fees, expenses and other costs, including mediator fees, shall be recovered by Claimants if they are prevailing parties (i.e., succeed on any significant issue or achieve the benefit sought in the dispute). Once the Parties have resolved the underlying dispute, they shall meet and confer regarding, or raise during any applicable mediation, the payment of Claimants’ reasonable attorney’s fees, expenses and costs incurred in resolving the underlying dispute. If the payment of attorney’s fees, expenses and costs is not resolved within thirty (30) days of the initial meet and confer on this issue, or during the applicable mediation of the underlying dispute, either party may submit the fee dispute to binding arbitration. The arbitration hearing shall be conducted by an arbitrator affiliated with JAMS, in accordance with the JAMS Streamlined Arbitration Rules & Procedures. However, those Rules will be modified as necessary to ensure that the hearing is held within thirty (30) days of the submission to arbitration, and that a written decision on the matter is rendered within sixty (60) days of the first hearing date. IN WITNESS WHEREOF, the undersigned have caused this Agreement to be executed by themselves or their duly authorized representatives on the dates set forth opposite their signatures.